Complete saddle set includes six original Fender® Gold Plated "FENDER" stamped saddles, genuine Fender® nickel plated intonation springs, stainless steel intonation screws and stainless steel saddle height adjustment set screws. Includes the following lengths of saddle height adjustment set screws: 4 of the 1/4" length for the E1 and E6 saddles and 8 of the 5/16" length for the B, G, D and A saddles. Includes genuine Fender nickel plated intonation springs, 2 short and 4 long. 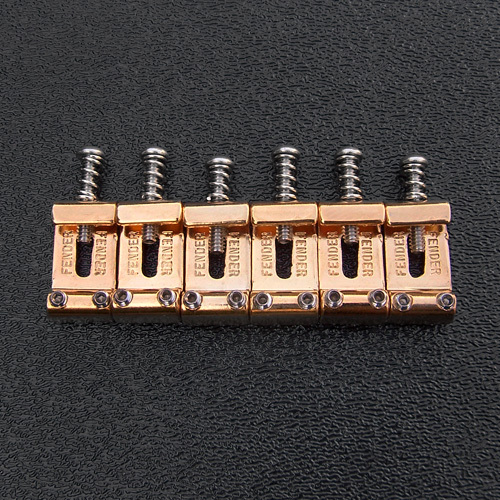 For vintage American Stratocaster® bridges with 2-7/32" E to E string spacing. Each saddle is approximately 0.435" in width. NOT for use with the narrower 2-1/16" string spacing of the American Standard or Mexican Strat.